- Plants and pots not included. High quality: Metal material sturdy and durable can hold plant safely. Dimension: 9.06*31.10in, diameter : 33cm(12.99in). Portable size fits to put it in different place, indoor or outdoor. Satble: Stable floor stand three feet ground stability, peripheral curve, prevent hurting, beautiful and practical. Special Design: Flower upper and lower parts and are used in grid shape design, the details of the polishing process, shaping every detail carefully, finished gloss. 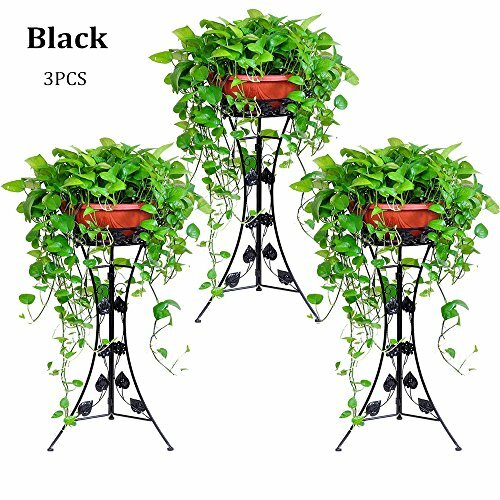 Classic: Perfect plant stand gift for gardener and it is a great home decor. Classic and elegant.